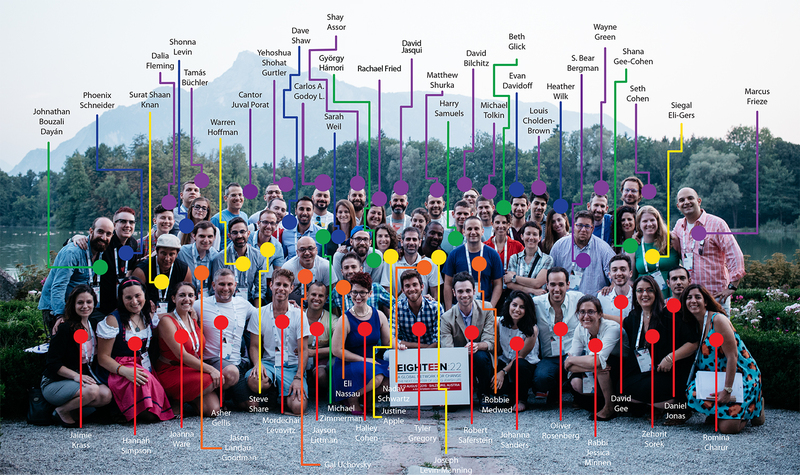 This past August the first ‘Eighteen:22’ network, gathered in Salzburg, Austria to talk about the next chapter of LGBTQ Jewish life. The official ‘class’ photo that was released to the media from that gathering really impressed me mostly because in my work as an editor of A Wider Bridge’s online magazine, I’ve managed to connect with many of these people, write about them, and highlight their work. But never have I seen them, these activists who do so much for the community, all in one photo. 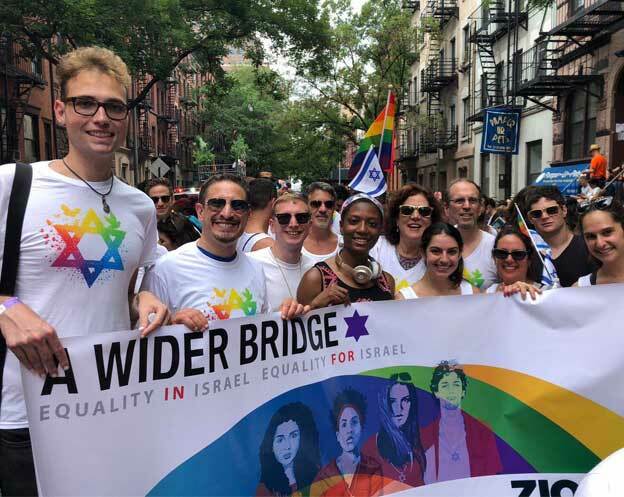 Then came the idea to turn this photo into a tool to help people looking to connect with the Jewish LGBTQ world get to know “Who’s Who” and get a glimpse of the wonderful work they’re all doing for the community and, frankly, for the world. So here’s the guide. Look for the names in the photo and then match them with the blurbs below, appearing in alphabetical order. Justine Apple (Toronto, Canada) is the Executive Director of Kulanu Toronto, Toronto’s leading LGBT Jewish organization, since 2008. In 2012, Justine was one of 23 Jewish leaders selected to participate in The Joshua Institute for Jewish Communal Leadership run by UJA Federation. In 2013, Kulanu Toronto was accepted as the newest resident of Genesis: UJA Federation’s Centre for Jewish Innovation. 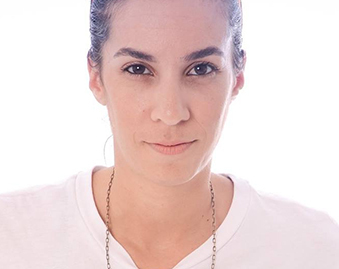 Justine is a Board Member of Congregation Shir Libeynu, pro-Israel LGBT organization A Wider Bridge and CIJA’s (The Center for Israel and Jewish Public Affairs) Local Partnership Council. Shay Assor (Israel) is working closely with IGY (Israeli Gay Youth Organization) leadership on the foundation of its Alumni Community. In addition, he works with Taglit Birthright Israel to build an Israel Community for the organization, reaching out to tens of thousands of Israelis who have joined the trip in the past. With over ten years of experience in Israel and abroad, Shay is helping organizations build and strengthen their communities and run meaningful, sustainable programs that help them better achieve their goals. S. Bear Bergman (Toronto, Canada) Award-winning writer, educator and storyteller S. Bear Bergman is the author of seven books as well as the founder of Flamingo Rampant, a children’s press focused on feminist, LGBTQ-positive, racially-diverse children’s books. His most recent book for grownups (Blood, Marriage, Wine, & Glitter) made several Best Of lists, has toured JCCs across North America, and was a finalist for the Lambda Literary Award. David Bilchitz (South Africa) – A Professor at the University of Johannesburg and Director of the South African Institute for Advanced Constitutional, Public, Human Rights and International Law. He is also Secretary-General of the International Association of Constitutional Law. David has published widely in the field of fundamental rights law and has also written several pieces on the rights of LGBTI persons and the potential clash with religious associational rights. David is heavily involved in the Jewish community: he is a founder of Limmud South Africa and is currently the chair of Limmud International. He has been vice-chairperson of Beit Emanuel Progressive Synagogue, has functioned as a lay religious leader for many years and currently heads the Jewish identity portfolio of his synagogue.